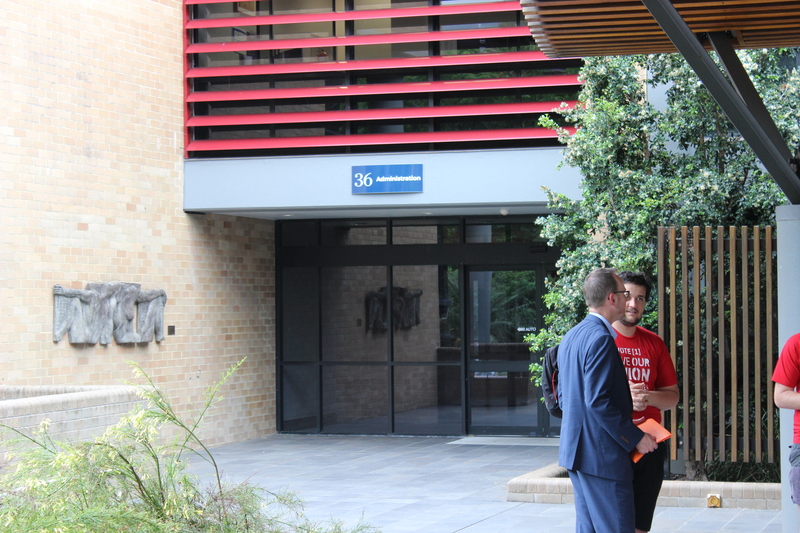 This Monday, student activists attended a rally held at the University of Wollongong, to protest a decision to exclude broad-left presidential candidate Chloe Rafferty from the Wollongong Undergraduate Student Association (WUSA) elections. Despite the election receiving widespread mainstream media attention, and being attended by a member of State Parliament, it seems almost unheard of across campuses in New South Wales. So what actually went down in the Gong? Successive WUSA presidents have been accused of acting against student interests. They’ve actively campaigned for fee increases, disaffiliated from the NUS and controversially shut down a book bank that provided free textbooks to students. Brewer argues that the “books were essentially sitting there collecting dust…there are Facebook groups that are the large marketplace for that sort of thing”. Additionally, whilst claiming to distribute minutes and the budget to members of WUSA, they failed to make any of these documents online- a task they are constitutionally required to do. The perception of the current WUSA executive has not been helped by university management, who have stifled other projects. WUSA does not have a ‘base funding agreement’ with the university, and receives no ongoing funding from the University’s SSA fees. When the Student Representative Forum approved a WUSA bid for 7.5% of SSAF in 2012, it was rejected by the university council. During the campaign, the Save Our Union ticket alleged that Brewer submitted a document to university management suggesting WUSA be wound up alongside a significant restructure of student representation on campus. Following this, the university made a $77,000 report into WUSA, in which it considered the possibility of shutting the student union down. However Brewer claims “shutting down [WUSA] was never the goal”, and that the report he submitted merely suggested restructuring student representation to make it more ‘inclusive’. 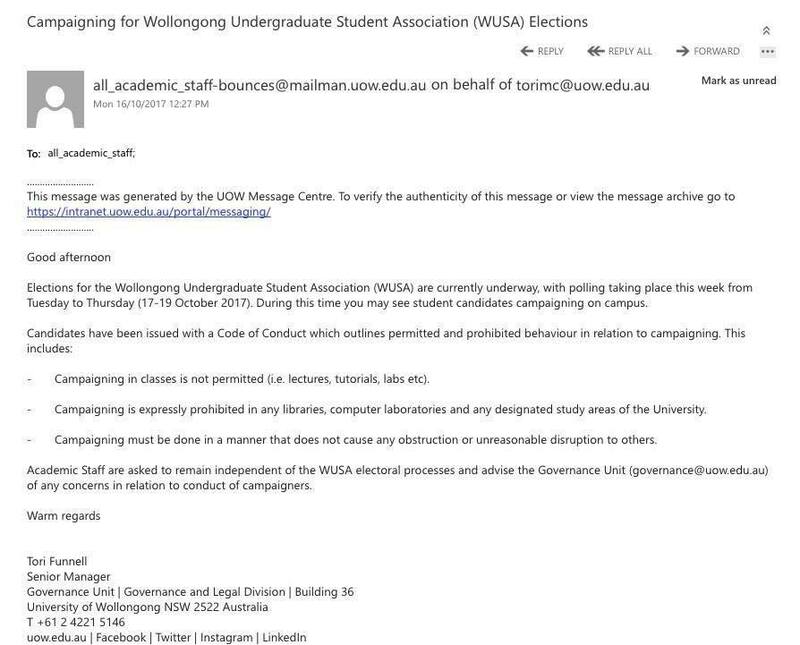 The University of Wollongong is no stranger to political scandals. In 2015, allegations surfaced that the University had made significant donations to and held strong ties with the Liberal party. Rafferty claims that up to $21,000 has been donated to the Liberal party by university management, which she believes speaks to their favouritism towards the campus right. Rafferty clashed with Brewer earlier this year in her position as National Union of Students NSW Education Vice President. She alleged in May that her membership had not been processed by WUSA, and that the WUSA executive were refusing to provide financial statements to it’s members. Rafferty was seeking to make public the rumoured report Brewer had submitted to university management. This year, Rafferty claims the left ‘had an opportunity where [they] could get together a broad left…and put together a coalition’ consisting of ‘labor-left, socialists, greens and students involved with environmental activism’ amongst others. Subsequently, the ticket ‘Save our Union’ was formed, with a heavy Socialist Alternative presence to contest centre-right ticket ‘Revolution’. Whilst Brewer firmly asserts that Revolution was not a ‘Liberal ticket’, Honi understands that much of the formation and leadership of the ticket were controlled by prominent members of the UoW Liberal Club. Additionally, Revolution’s presidential candidate Zachary Fitzpatrick is a member of the Liberal Party. The election concluded with both Fitzpatrick and Rafferty being excluded from the election, resulting in third candidate, Timothy Piert, being elected with just over 5% of the popular vote. His campaign focussed primarily on banning megaphones from being used outside university libraries, a policy aim that may put him at odds with Socialist Alternative, student activists and megaphone companies. The findings from the WUSA appeals panel state that Rafferty was excluded for campaigning in classes despite receiving a formal warning. Rafferty contests this claim, stating that she spoke in lecture theatres before the classes had commenced- a method of campaigning used across Australian campuses. Additionally she states that at no point had ‘Save our Union’ been told that this form of campaigning was in breach of the electoral regulations. Emails to staff members outline the types of campaigning that are not allowed in classes, which Rafferty argues demonstrates University management’s wilful decision not to provide students with due notice. Greens MP David Shoebridge stated at the rally ‘“if you get sacked for running for office because you tell people you’re running for office there’s something pretty crooked in the rules”. The appeals panel stated that all candidates had acknowledged these rules. Zachary Fitzpatrick, the Revolution candidate for President, was also excluded for “conduct that could prejudice the election and compromise its outcome”. Honi has obtained recordings that suggest Fitzpatrick was involved in a deal that would see dissenting members of ‘Save our Union’ appointed to WUSA in exchange for them testifying against Rafferty. Students are now protesting the decision to disqualify Rafferty, arguing that it is an ‘undemocratic attack on students’ rights to free speech’. Statements made by Vice-Chancellor Paul Wellings suggest university management is reticent to interfere with the appeals board’s decision. The WUSA Election Regulations note that decisions of the Appeals Panel are final. Therefore, it appears formal legal processes may be the only viable option, a possibility recognised by both Shoebridge and Rafferty. Rafferty told Honi “university management think that student democracy and free speech is a threat to the way they want to run campuses…and that’s why it’s worth fighting for independent democratic student unions”. Honi reached out to Revolution’s Zachary Fitzpatrick, WUSA President-Elect Timothy Piert, and Vice Chancellor Paul Wellings for comment, but no response was received by the time of publication.